On Mother’s Day we went over to our friends Erik and Jen’s for some grilling. It was a beautiful, sunny day in Chicago and we offered to bring some dessert. No idea why since I’m not much of a baker. Well not much of cake baker at least. If I had to rank my dessert making skills I’d say I make pies the best with cakes way down on the list. Tarts are somewhere in the middle since they’re pie-like but require some extra ingredients. That said, I really can’t believe how simple it was to make this delicious tart. Minimal ingredients and minimal time. Previously I’ve written on how I think Michael Ruhlman’s Ratio is a book/tool everyone who cooks should have, and this sweet treat is a perfect example of why. I know the whole idea of boiling down cooking (reducing even) to simple ratios can be hard to swallow (groan) but they work well and give a good foundation to build on. Start with simple things and slowly build upon them as you get comfortable with the ratios. 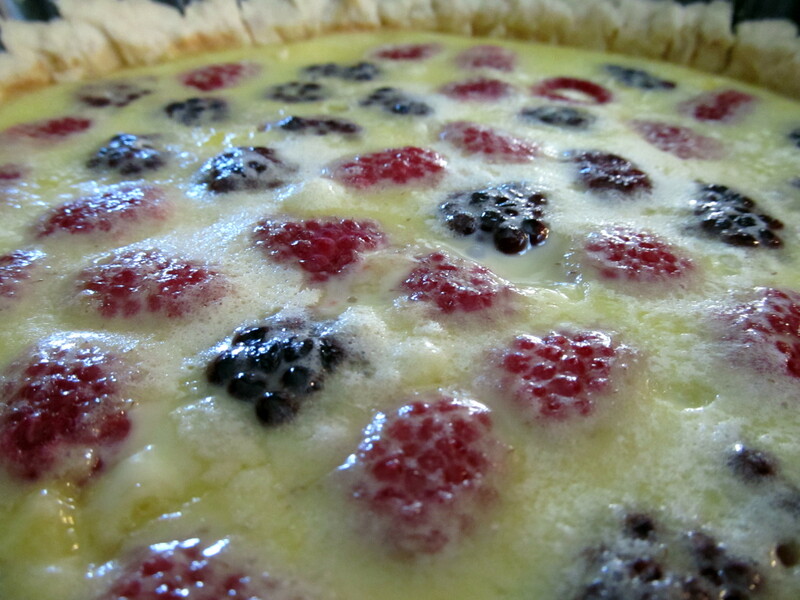 With this tart I used two ratios from the book: 3:2:1 pie dough and 2:1 custard. Could it be any simpler? And here’s the ingredients: flour, butter, water, eggs, cream, sugar, berries. Simple. The actual prep time is very little. Make the dough, mix the custard, combine. All will probably take you 15 minutes. The wait is of course in the baking part but as you may have heard, all good things come to those who wait. And this tart delivers! As we really get into spring here in Chicago and inch our way towards summer this is a perfect dessert for a warm, sunny day. Give it a go for your next Sunday dinner. Add the salt to the flour. Mix in the butter with your fingers until pea sized lumps form. Add some water and mix well. The dough will get sticky but eventually come together. Wrap in plastic wrap and place in refrigerator for at least a half an hour. Preheat the oven to 325°F. On a generously floured surface roll out the dough into a 9” round. Place into a fluted tart pan (or springform pan or pie plate) and press the sides, making a lip of about an inch or more. Place some parchment paper or aluminum foil on top of the dough in the bottom of the pan and place pie weights, beans, or rice on top the foil/paper. Place in oven and bake for 20-25 minutes. Remove the pie weights/beans/rice and foil/paper. Continue to bake for another 10 minutes. In a large bowl whisk together all ingredients. 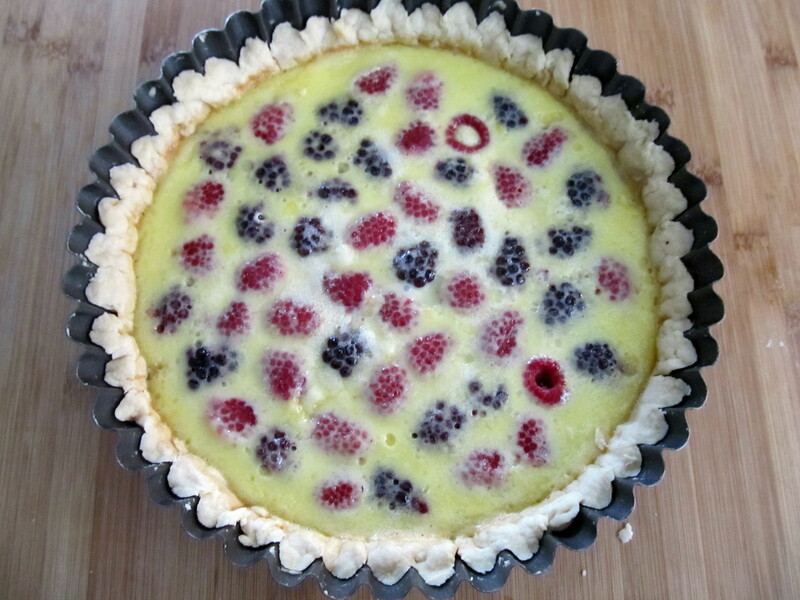 Arrange the berries in the empty tart shell. Pour the custard over the berries into the shell. Make sure the berries are evenly spaced. Put the tart into the 325°F oven and bake for 50-60 minutes until the custard is set and a toothpick comes out clean. Allow to cool, slice and serve. Great looking tart! I do enjoy a good custard tart. I have a lovely English custard tart on my blog somewhere – it was to die for. Thanks! I still can’t get over how simple it was to make. Man that looks great. I’ve found a new found love… well more like “like” of baking in the last couple of years, but I’m definitely more of a cook than a baker. I’m way more of a cook than baker. More practiced at it probably, since I’m not making chocolate cakes for dinner every night! My sister’s the baker of the family. I just feel like they nurture two different parts of my personality. With cooking I feel creative abd daring, but with baking I feel a sense of calm in the process. In no way do I feel calm when baking! Ha! That sure makes sense! I’m going to have to look for that book. Thanks for the recommendation! It’s a great reference tool!